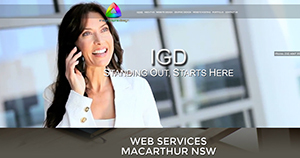 We have been designing and developing websites for Wollondilly Business of all types and sizes since 2001. Cafes, Lawyers, Restaurants, Accountants, Catering you name it, we have done it. Image (IGD) have been fortunate to be an integral part of some wonderful start up businesses that we have seen expand internationally and also globally and they still call and rely on us to be part of their online and print marketing.